ENFJs are some of the most inspiring and motivational people you will ever meet. They are driven to understand humanity, to peer into its heart and motivate it to its highest potential. ENFJs lead with Extraverted Feeling, a powerful function that allows them to innately understand the emotions and moods of other people. They can sense what will reach other people’s hearts, what words will heal, encourage, and restore. They desire to bring harmony into the world around them and they work tirelessly to improve the lives of their loved ones. ENFJs are often ceaselessly devoted to improving the world. Their global perspective gives them an eye for any and everyone who is in need or troubled. Many ENFJs have made a powerful impact in our world; people like Nelson Mandela, Maya Angelou, Oprah Winfrey, and Neil deGrasse Tyson. If you know an ENFJ, what you will see most readily is their dominant function; Extraverted Feeling (Fe). Fe gives them their unique “empathic” ability to sense other people’s emotions and motivations. ENFJs combine Fe with Introverted Intuition (Ni) to see the potential in other people, to see where their lives could lead, and what will motivate them. ENFJs have a constant eye on the future and are driven to make a difference in the world and improve lives. In this article we’re going to get a good look at the ENFJs dominant function, Extraverted Feeling. In the future we will delve deeper into their other cognitive functions, Introverted Intuition (Ni), Extraverted Sensing (Se), and Introverted Thinking (Ti). This is one of the many reasons why ENFJs can make such uplifting friends and family members. Where certain types are more prone to seeing what’s wrong with someone or something, the ENFJ is more likely to see what’s right and to promote that. This ability creates such a sense of belonging for the people around them and is why ENFJs tend to attract friends. 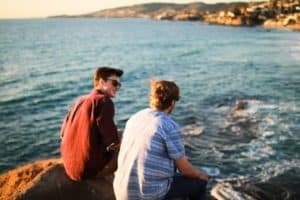 ENFJs are inspired and energized by bringing people together; they are skilled at seeing many disparate viewpoints and finding the common tie between them. This makes them masters of peacemaking and diplomacy. They see what people have in common, what they share, and prefer not to get hung up on differences. They desire to give everyone the confidence to achieve their highest ideals and ambitions. This ability is why many typologists call the ENFJ “The Teacher”. Because Fe is a judging function, ENFJs very much desire closure in their decisions. They hate to have things left open-ended for long, and thrive when they can quickly move towards their goals. This can be a good thing, because it makes them especially productive and ambitious, but it can also cause them to decide too quickly or form judgments too hastily. This is where their auxiliary intuition (Ni) is so important; when Ni supports Fe it ensures that ENFJs reflect on their decisions and don’t rush headlong into them. ENFJs who do not develop Ni adequately can be too quick to form opinions or reach conclusions. ENFJs are very enthusiastic, friendly, future-focused individuals. They are likely to be very driven and hard working, focused on achieving their goals and encouraging others to do so as well. They are courteous and kind, employing good manners and trying to maintain positive morale wherever they go. ENFJs are likely to value jobs that put them into direct contact with a variety of people. They enjoy getting to understand people from all walks of life. This is why, according to the MBTI® Manual, ENFJs value “nurturing affiliation”, “friendships”, “learning,” “creativity”, and “community service”. They are often drawn to careers in teaching, the arts, or religion, where they can use their unique brand of inspiration and insight to encourage and propel people towards their goals. ENFJs are not afraid to talk about complex, emotional topics. While their Fe gives them an appreciation for good manners and courtesy, their Ni gives them a curiosity and complexity that is stimulated by deep, theoretical subjects. There’s usually not any topic they are unwilling to discuss in-depth if it will broaden their understanding of humanity. Another interesting quality about ENFJs is that they are usually skilled at making fun of themselves to dissolve conflict, lighten the mood, or give other people a feeling of solidarity. They have a natural charm and charisma, and even when they poke fun at themselves it only makes them seem more approachable and engaging. While ENFJs are dominant judging personalities, who can form rather quick opinions, they also know how to laugh at themselves and enjoy the little things in life. This ability makes them come across less direct and commanding than many other EJ types. 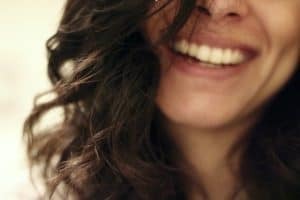 ENFJs are easily able to sense other people’s emotions, but they may struggle with recognizing their own. 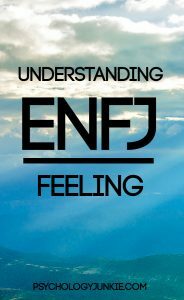 Extraverted Feeling (Fe) focuses outwards, towards other people, and as a result ENFJs may be unaware of what they are feeling inside. ENFJs may feel lost or perplexed when dealing with their own emotions, which means that they (rightly) will seek outside help when they are emotionally overwhelmed. Externalizing their emotions allows the ENFJ to channel them through Fe and then understand them better. It’s very important for ENFJs to have a trusted friend or family member they can talk to who can help them to discern and find validation or direction for their emotions. Another good way for the ENFJ to understand their own emotions is to write them down and read the notes back to themselves. This allows them to understand their emotions in a much clearer and more organized way. – They are visionary and insightful. – They focus on the future more than the present or past. – They are friendly, tactful, and polite. – They greatly value harmony in their environment. – They like to have closure on decisions, and may come to decisions too quickly as a result. – They care very deeply about humanity as a whole. – They enjoy getting to know a wide variety of people. – They are loyal and committed to their loved ones. – They are very conscientious and empathetic. – They can easily sense the feelings of others. – They are sensitive to conflict and tend to take criticism personally. – ENFJs are one of four types in college reporting the highest levels of assertiveness. – In a national sample, ENFJs rated highest in coping with stress by “Exercising”. – In a national sample, ENFJs ranked highest in “Belief in a higher spiritual power”. – Female ENFJs are among three highest on one out of two measures of creativity. – ENFJs are rated by psychologists among two types least likely to have trouble in school. – ENFJs prefer the academic subjects of art, English, and music. Want to know more about ENFJs? Check out these amazing books! You might have mis-typed the Canadian Prime Minister. He shows a lot of ESFJ traits lately. The more he speaks, the more they surface.